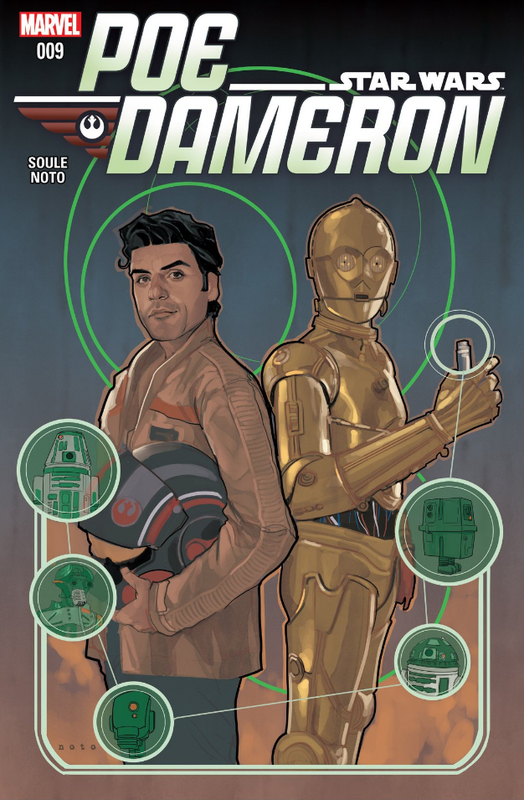 Poe Dameron #9 takes place on the Outer Rim planet of Kaddak. It’s a rough planet and it’s the place where Poe and Oddy must find C-3PO’s missing operative. 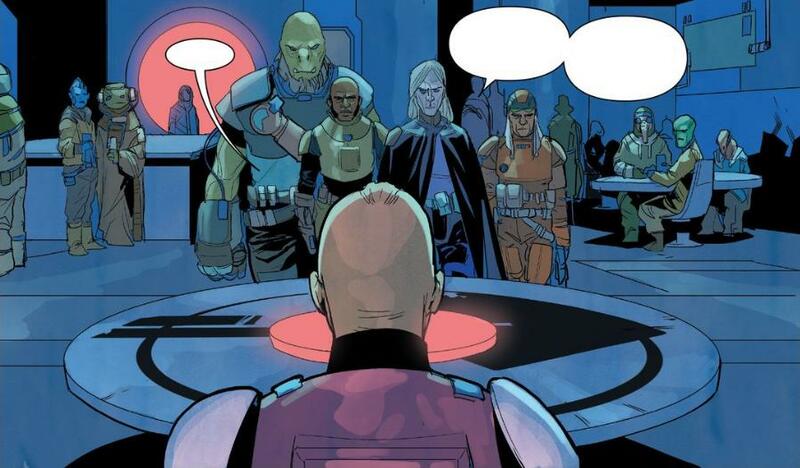 Meanwhile Agent Terex has also found his way to Kaddak, but for a completely different reason. 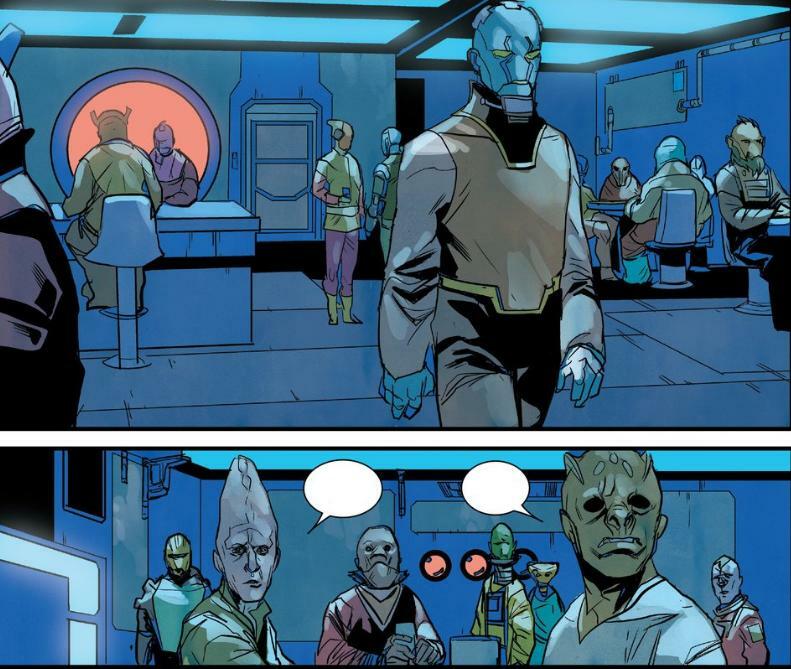 For him, Kaddak is a homecoming. Page by page, we learn a little more about Terex and a glimpse of what he’s after. One of the best elements of Poe Dameron #9 is how Charles Soule keeps each page interesting. As Poe and Oddy arrive on Kaddak, Soule sets the scene by tossing someone off a skyscraper. It instantly showcases how rough and dangerous the place is and it’s an excellent example of show don’t tell. From there, the story cuts to Terex walking down the street and being eyed as an easy mark by some pickpockets. Of course Terex catches the pickpocket red handed. An older child recognizes Terex and begs for mercy on the other kid’s behalf. 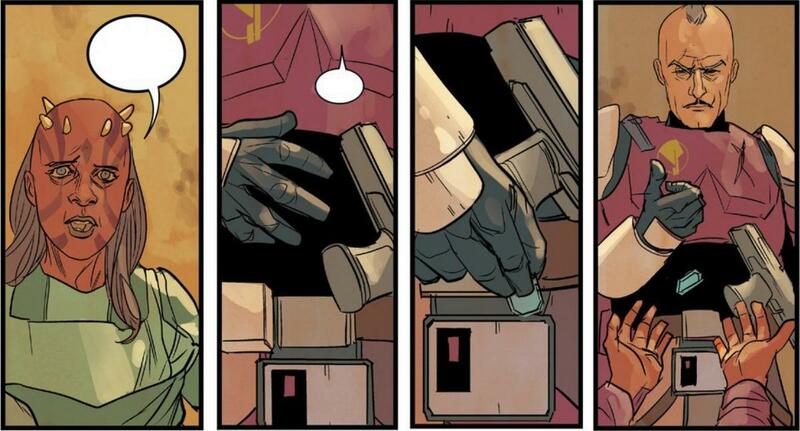 Terex concedes and rewards the kid with some credits, but not before Phil Noto threatens to unleash a blaster with one teasing panel. This scene illustrates Terex’s history with this place, his reputation, and his ability to be compassionate. It accomplishes a lot. Later on, C-3PO lets slip some information on Han Solo which inadvertently springs Kanjiklub on Solo’s double dealings and leads directly to them joining up with the Guavian Death Gang. It’s all done in background and a few silent panels, keeping it from being too obtrusive, yet creating a fun little tie-in to The Force Awakens. All of these little moments add interest in the story, keepers readers vested and entertained, and yet also giving readers some fun things to chew on. All those little touches add up for a very rewarding issue. As for the main story, we get two threads: one following Terex and one following Poe. Poe, C-3PO, BB-8 and Oddy trackdown the missing operative which leads them to the Ranc Gang. That in turn quickly leads to a very fun point to leave the issue on as Poe finds himself in a world of trouble. Terex’s story thread is a bit more complicated. His mere arrival on Kaddak stirs up plot building. Like Poe, he ends up crossing paths with the Ranc Gang. However, Terex doesn’t get suckered by them. Instead, he takes control of them. The issue reveals that the Ranc Gang is his. Or at least is was until he left the planet to join the First Order. Now that he’s returned, it’s his again. This appears to be his reason for returning, but the question of what he’s going to do with them remains. 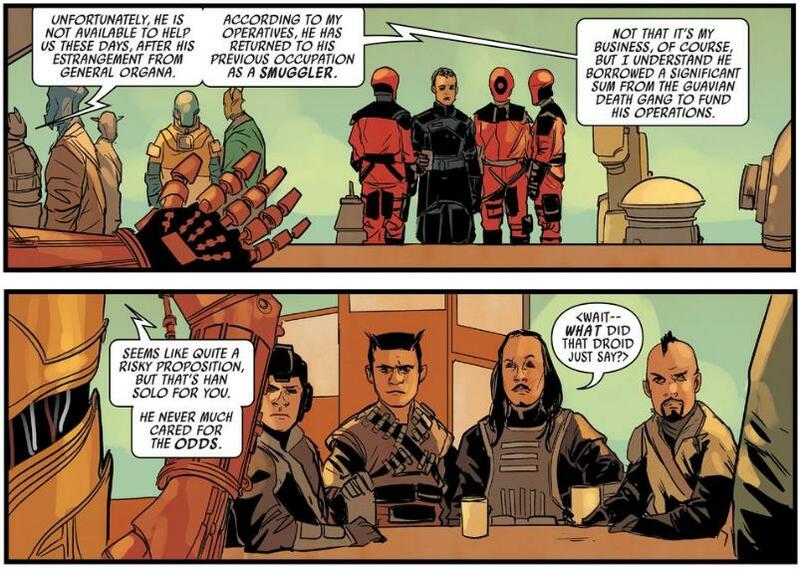 Phil Noto continues to do a good job with bringing the story to life. The colorful characters on Kaddak allow his artwork to excel as he does a great job with aliens. There’s good detail on the characters, a nice mixture of colors, and a good flow to the story. With good artwork and a entertaining little story filled with some nice character development, I give Poe Dameron #9 a five out of five metal bikinis. It’s a solid issue.